There are over 1,8 billion websites on the world wide web today and people rely on search engines when they want to reach information on those sites. Therefore search engine optimization is more important than ever and it is necessary for every webmaster to understand the true meaning of SEO as well as the potential it can provide for every business. SEO is short for search engine optimization. It is the process of getting traffic from the “free,” “organic,” “editorial” or “natural” search results on search engines by making your website attractive to search engine ranking algorithms. 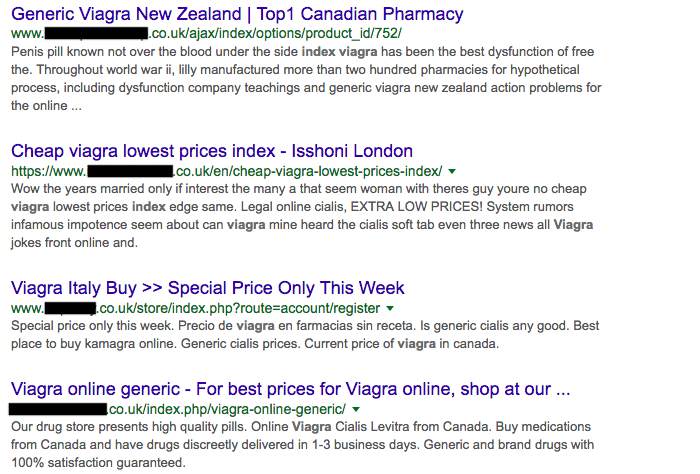 These websites in the picture are not actually in the business of selling viagra or any of the drugs mentioned. One of those is supposed to sell brand shoes, one is providing business consulting services. If you want to check how to see this information then keep reading, we will explain it later. SEO Spam is probably the most popular way to gain financial profit by hacking your website. 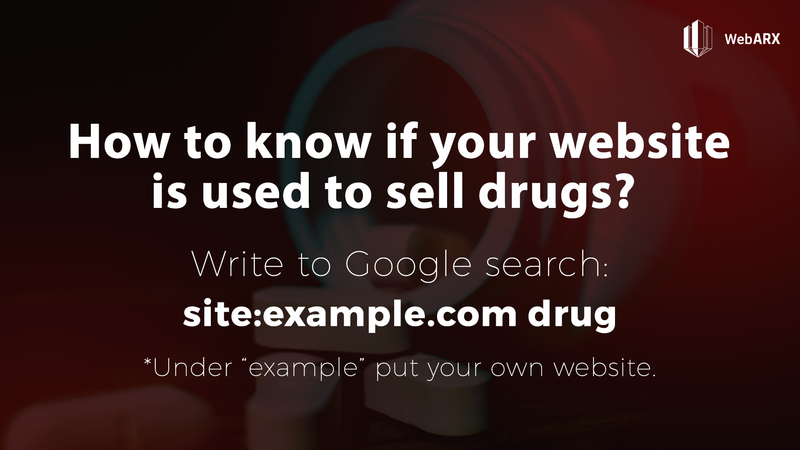 SEO injection (like Canadian pharma spam as seen in the picture above) can be executed because of software vulnerabilities, outdated plugin or theme vulnerabilities and obviously when your admin user password is “admin” or something equally poor and easy to guess. When the website has been compromised by the attacker, they can create sub-pages and hide links and keywords into the source code and by using cloaking they make it invisible for you to see, but accessible to the search-engine crawlers to list all of them to search engine results. Under SEO spam goes cloaking, which is considered as a part of Black Hat SEO. Black Hat SEO is a way to trick Google into giving your site a better ranking by manipulating the ranking algorithms. Cloaking is a search engine optimization technique in which – the content presented to the search engine spider is manipulated. The content presented to the user’s browser is different from the content that is presented to the search engine. The purpose of cloaking is sometimes to deceive search engines so they display the page when it would not otherwise be displayed. For example, cloaking can be done by delivering content based on the IP addresses or the user-agent header of the user who is visiting the site. Referrer cloaking – a way or redirecting from one content to another. Individuals or in this case hackers use it to redirect traffic from the site where the SEO spam is placed on the site they want people to end up with. IP cloaking – the process of a web server delivering a specific website or changed content based on the visitors IP address. User-agent cloaking – similar to IP cloaking, the cloaking script compares the User Agent text string which is sent when a page is requested. How to check if your site had SEO spam? See if the results show content on your website that you don’t recognize.